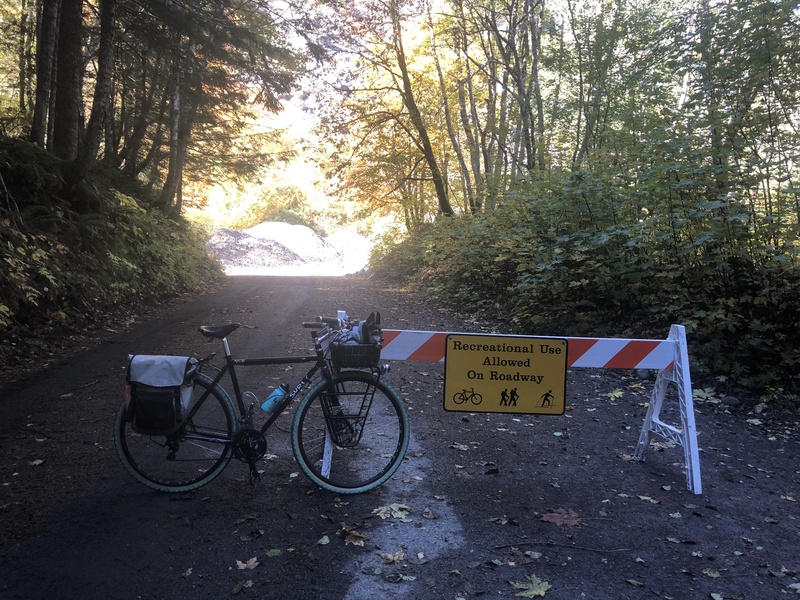 I found a great car-free biking spot nearish Seattle/nearish Portland: Westside Road, very close to the Nisqually Entrance of Mount Rainier. 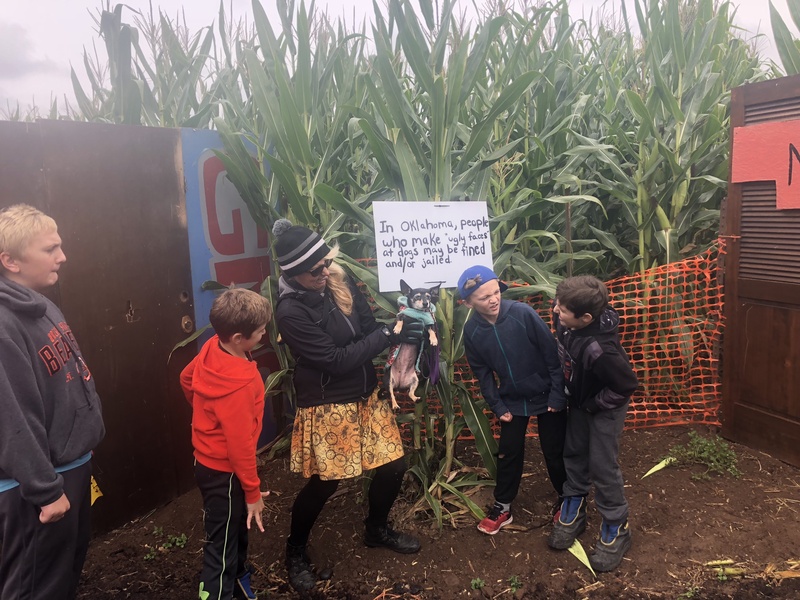 I didn’t have the kids with me for this trip, nor did Joe “Metal Cowboy” Kurmaskie, but it would be really fun to take kids on all or part of it. There was a plan once for a highway that would encircle the mountain, a road through the high alpine wilderness, a dream of twentieth-century engineering that never quite materialized. 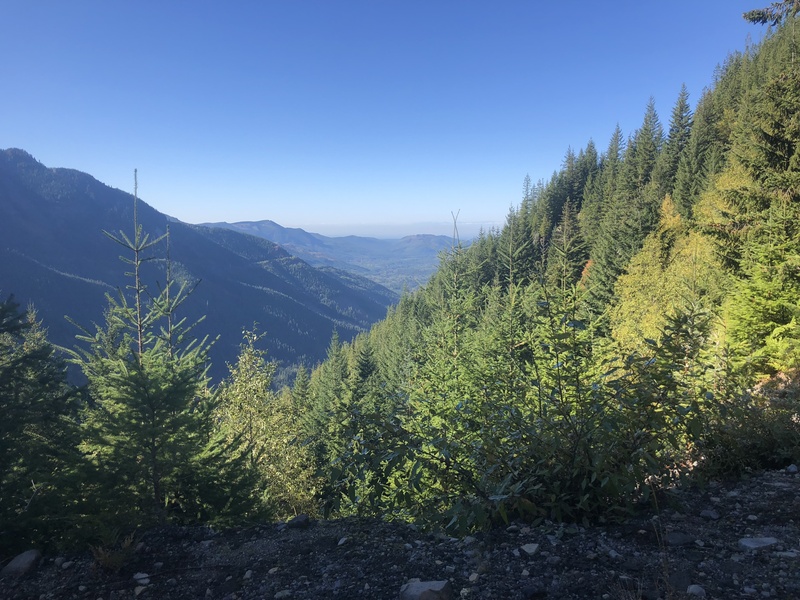 Budgets, priorities and simple topography combined forces to kill the idea, but parts of the vision were actually completed, and one of the key portions is this spur road from the Nisqually River to the Puyallup River. It doesn’t take too long after leaving the parking area for the feeling of wilderness to take hold. The road follows Fish Creek at first, before a major washout and a log crossing, then climbs along a little copper-colored stream, another tributary of nearby Tahoma Creek. 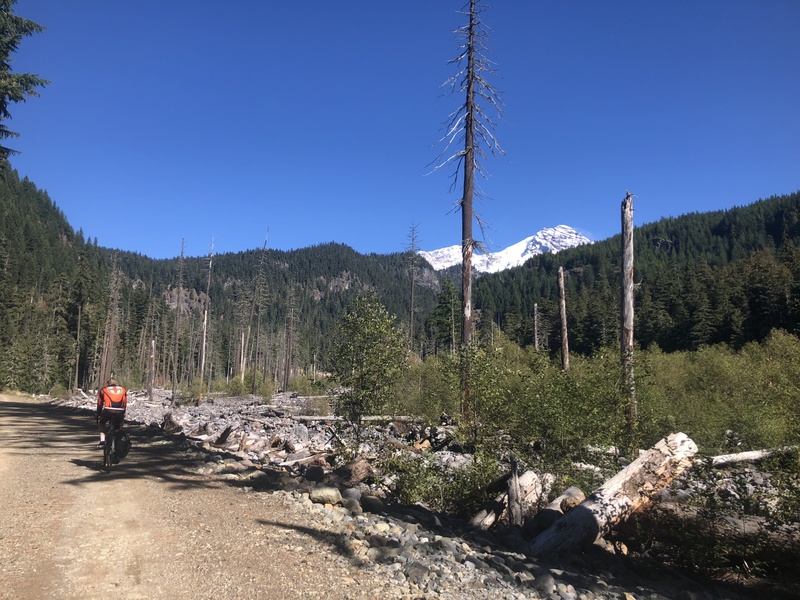 Over time, volcanic flows of water and rubble have scoured the surrounding area and the ghost forests in the flood path provide ample evidence of the power of the mountain. 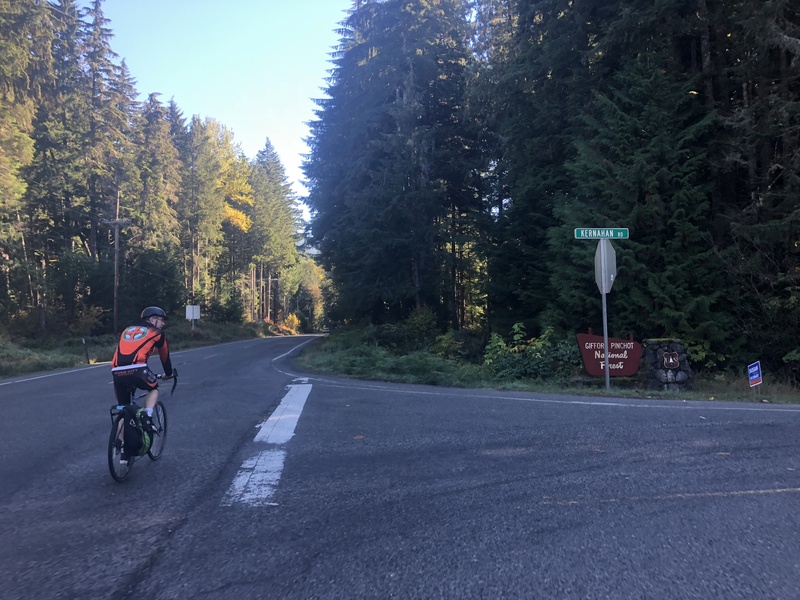 The Westside Road is a gravel road just one mile past the Nisqually Entrance. The first three miles of it are open to cars (we only saw one car driving, and four parked) and then it’s nine miles of car-free gorgeous scenery. 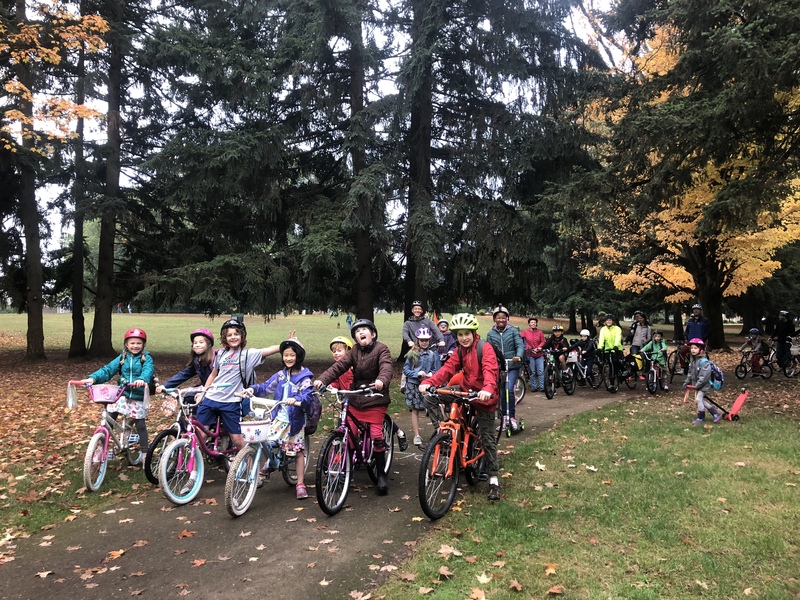 There’s a parking lot just before the gate so the easiest ride with kids would be to drive into the park and as far up the Westside Road as possible before getting on bikes. 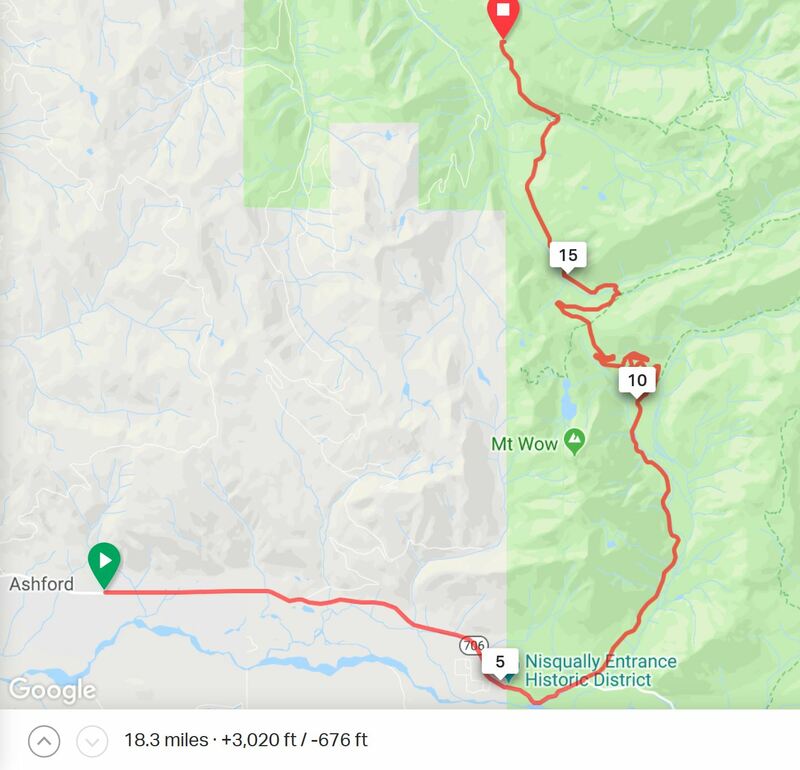 This is probably also cheapest: Mount Rainier entrance fees are $30 for a vehicle and its passengers or $15 for each bicyclist. 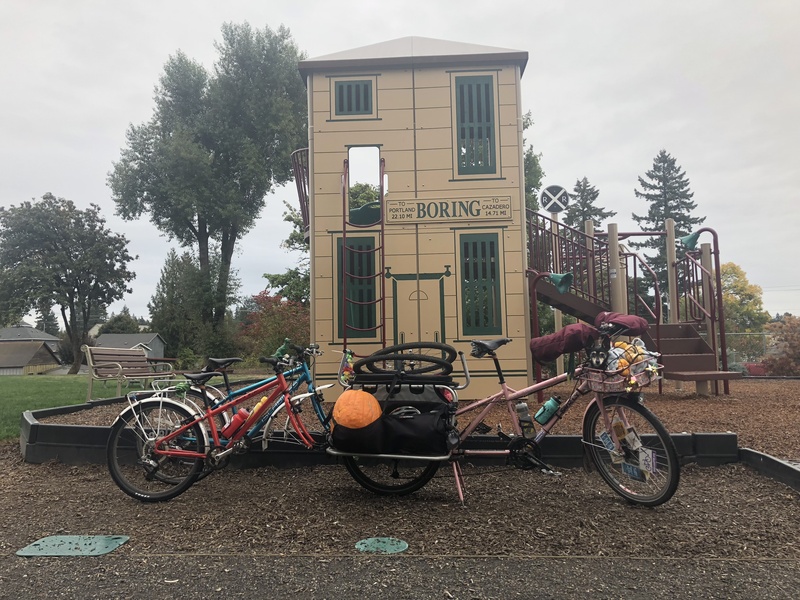 For this trip we stayed at Nisqually Lodge (which I found via the BringFido website), just five miles from the park entrance so we left the car there and biked over. 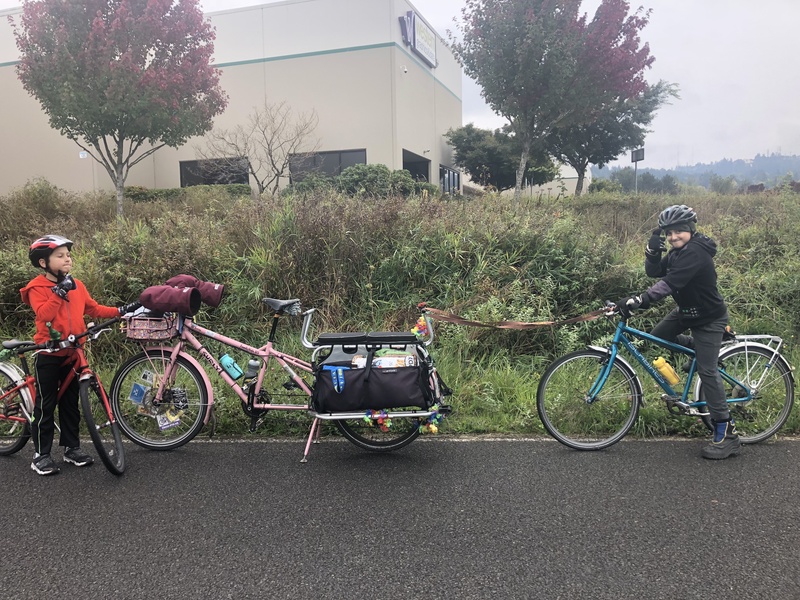 There’s lots of lodging there in Ashford and a decent shoulder for biking along, though I don’t generally ride on roads like that with my kids. 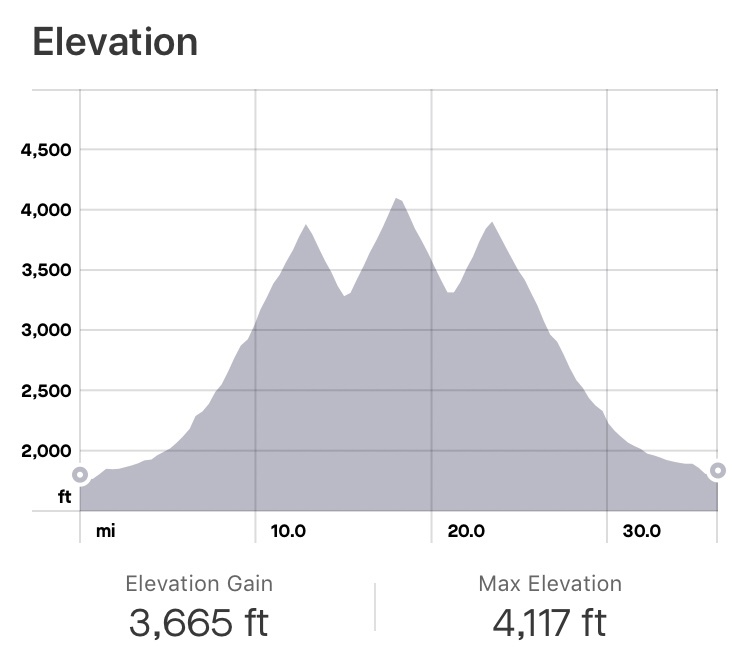 Most of the Westside Road is uphill so the easiest thing to do with kids would be to ride the first four miles past the gate before it heads downhill. At this peak before the real peak is a clearing and the Marine Memorial Airplane Crash Monument, making it a fine turn-around point. After the memorial the trail goes downhill for two miles and then uphill another three to reach Klapatche Point. A lot of the trail is gravel, but some is dirt which meant for some muddy spots. None of the mud was too squishy for either climbing slowly or descending quickly through, during this visit anyway. I can imagine the mud might be a bit of a problem during and after rainy spells. The elevation at Klapatche Point is 4140 feet so we didn’t get to see any snow or marmots up close. 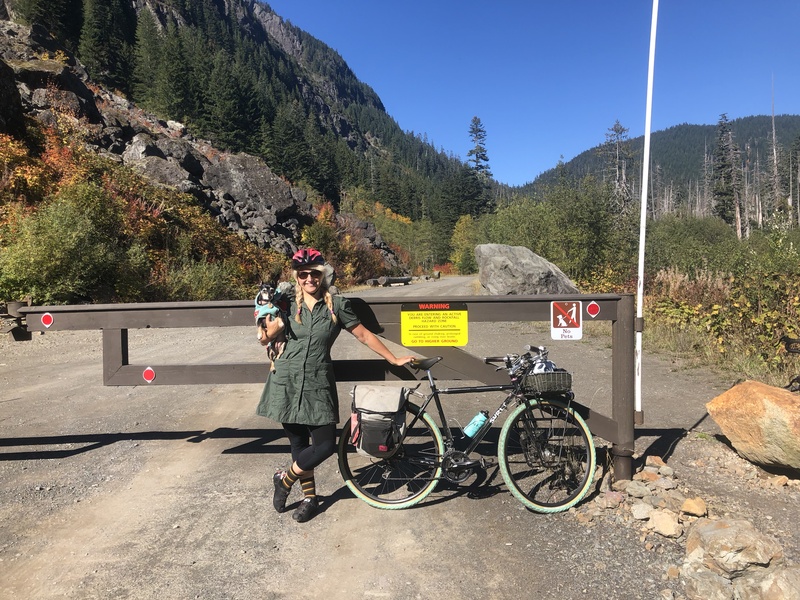 Speaking of animals, I let Pixie out of the basket to stretch her legs on the outside of the gate and then kept her cooped up for the entire “No pets” part of the trail, which I think is OK per national park rules since her feet didn’t touch the ground. 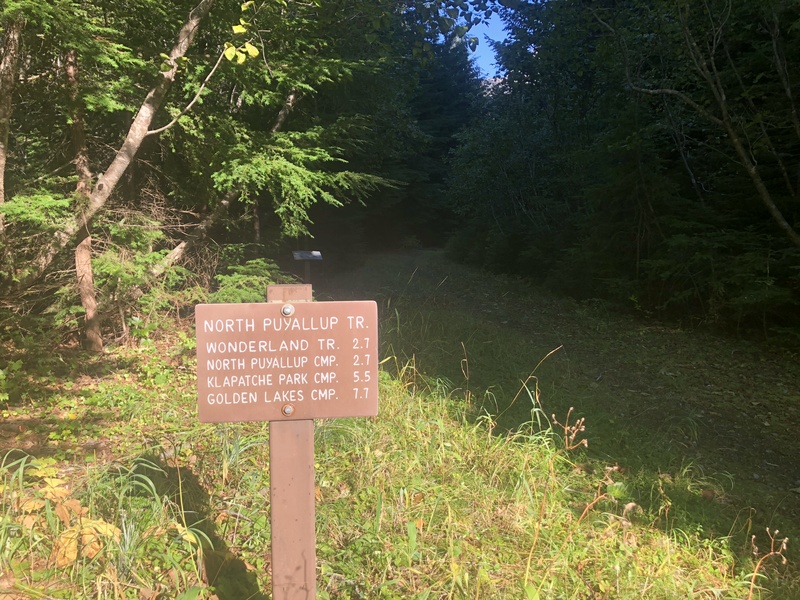 The road crosses several hiking trails upon which bikes aren’t allowed, but at least one goes to a waterfall and there are backcountry camping areas along them. 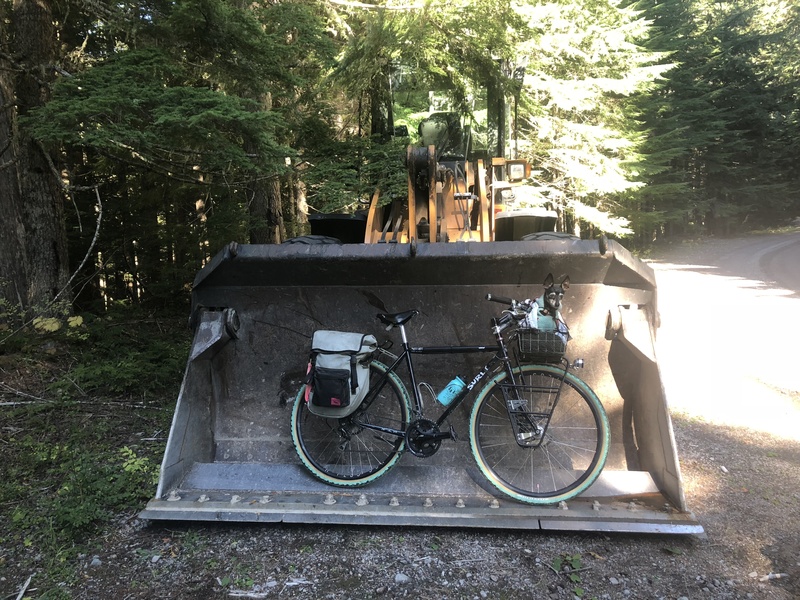 It seems like it’d be safe to lock a bike at a trailhead and add a hike and/or campout to the bike ride. 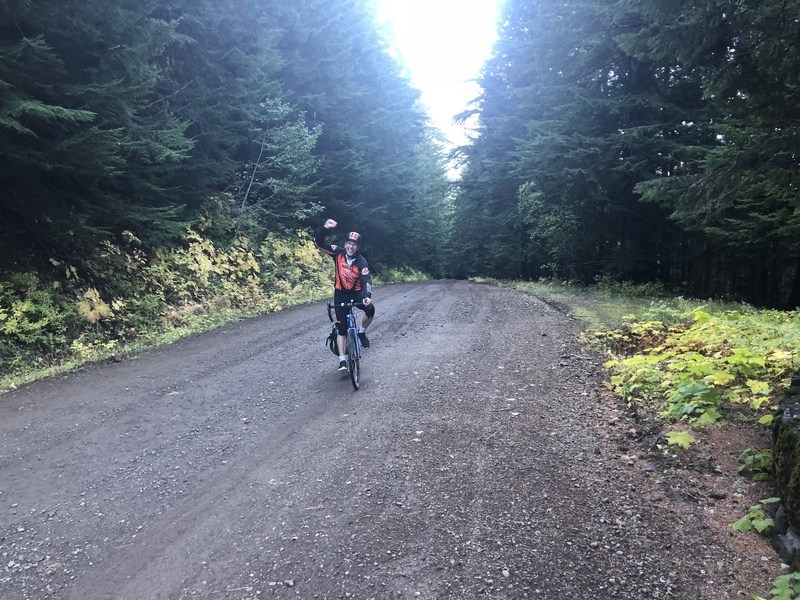 Thanks to my friend Deb who rides Rainier often for the route advice! My original plan had been to ride up to Paradise again, but this was such a different experience and so fun! It was reminiscent of riding to Ipsut Creek for the 2016 Swift Campout, but much smoother than that gravel. 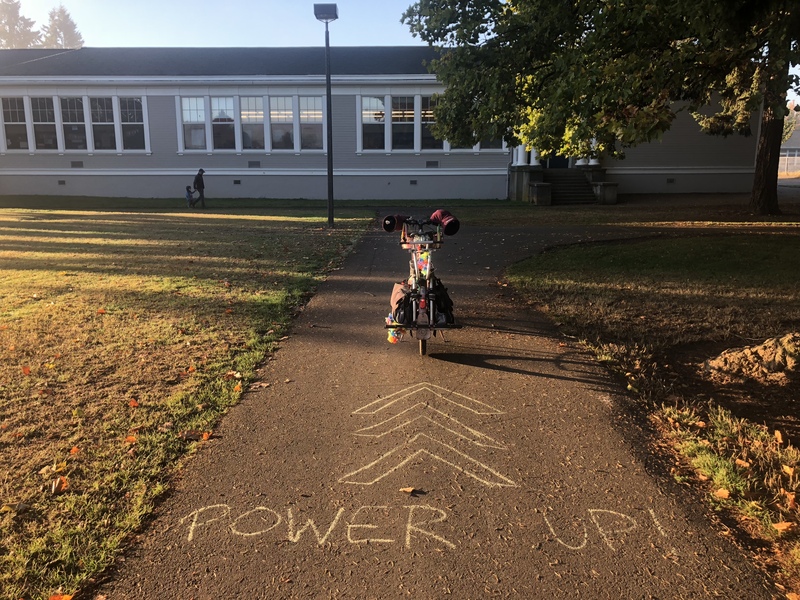 Happy Walk + Roll to School Day! 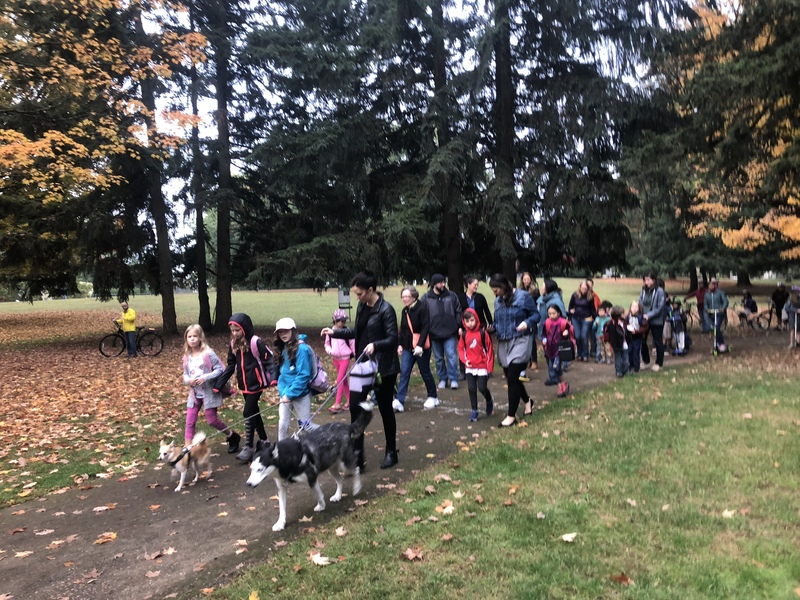 Yesterday, 10/10, was International Walk to School Day! 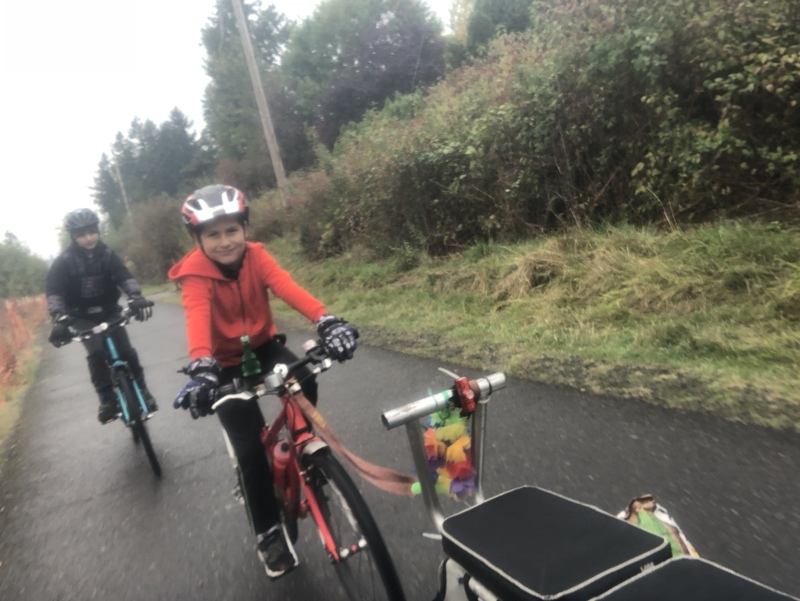 …which in recent years has turned into Walk + Roll to School Day to include all active transportation…and come May when we celebrate what was originally Bike to School Day, that’s also Walk + Roll to School Day so active transportation is celebrated twice. Or celebrated every day of the year if you’re like me. But having a big party to celebrate other kids actively transporting themselves with us is fun to do on a couple special days. 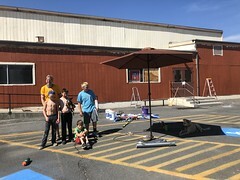 This year I hosted a party in the park adjoining our elementary school (grades K through 5) to keep things close and easy. It worked great! I’m so impressed that people made it out earlier than normal–we had nearly 100 participants, starting at 7:30 a.m., for a school day starting at 8:15 a.m.
We gathered at the picnic table area, which is conveniently under tree cover to protect from drizzle. Luckily the skies were drizzle-free and grey, which keeps things warmer than blue skies this time of year. We couldn’t have asked for a better day. Our party featured prizes, snacks, and music, then at 7:50 a.m. the 42 walking and scooter riding participants (and three dogs) set out for a 0.23-mile parade along the curving path through the park to the front door of the school. As soon as this first parade took a left towards the front of the building the biking contingent of 47 set out for a slightly longer pedaling parade around the back of the school to end up at the bike racks, utilizing the wide-open school yard rather than the busy sidewalk in front of the building. It worked great! I hung out at the bike rack for a short while, handing out prizes to last-minute-arriving walkers and bikers. Some had forgotten about the party and some hadn’t known to begin with. There’s always room to work on promotion and advertising, it seems. Here in Portland we’re lucky that we can get free prizes to hand out! This year the prizes came from the City of Portland, but in previous years they’ve come from The Street Trust. 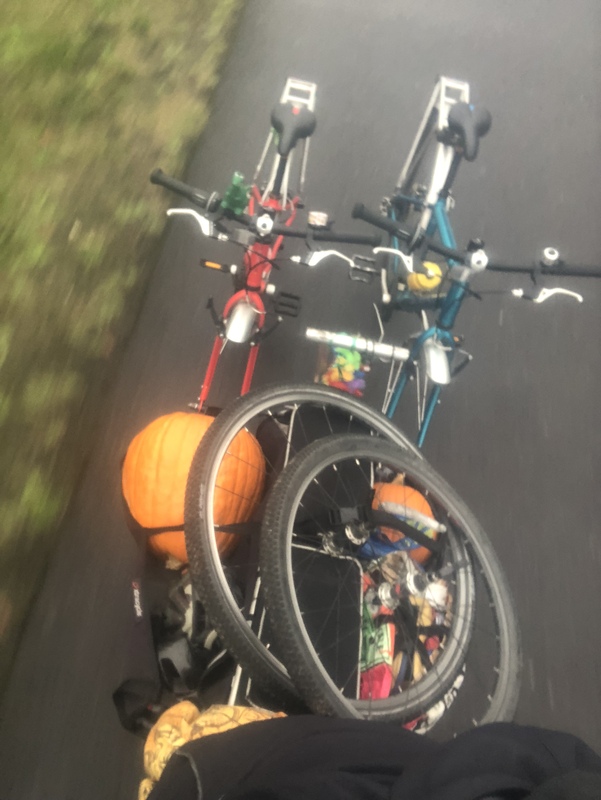 We had stickers, temporary tattoos, sunglasses, reflective emoji key chains, pencils, and front and rear bike lights! They also provided four color posters we hung around school with details about our event. Our PTA voted to allocate $100 to us for supplies this year which we used some of for snacks. Last year I paid for everything out of pocket so this was really nice! I went with my co-organizer, Carolyn, to Costco last week and we selected big boxes of individual serving gummy fruit snacks and goldfish crackers and I have a lot left for future events. Leading up to the event I was very worried about coming off as un-cool because I said there would be music and I have no idea what kids listen to these days and never recognize any of the music at school events. Fortunately, I checked in with a friend who has two teenagers and he told me about the “Teen Party” playlist on Spotify. I listened to it and deemed it not peppy enough, but it gave me the idea to search Amazon Prime and I found the “Good Morning, Tweens” playlist which was perfect! * Posters. I already mentioned the four big color posters from PBOT. That was my only paper advertising this year, but I’m allowed to use the school staff black-and-white copier to make flyers so I could have designed my own posters or flyers and printed them for free, too. * Newsletter. I posted a blurb in our weekly PTA newsletter for three weeks leading up to the event. * Announcement. We have a Friday Morning Meeting in the gym every week. It’s the first half hour of the school day and many parents stick around for it, so making announcements is a great way to reach all the students, all the teachers, and some of the parents. Most announcements are done in skit form so I might need to up my game come May because to date I’ve only stood and talked. I spoke to the crowd the Friday before our event, but leading up to and during May I tend to speak each week. * Sidewalk chalk ads. 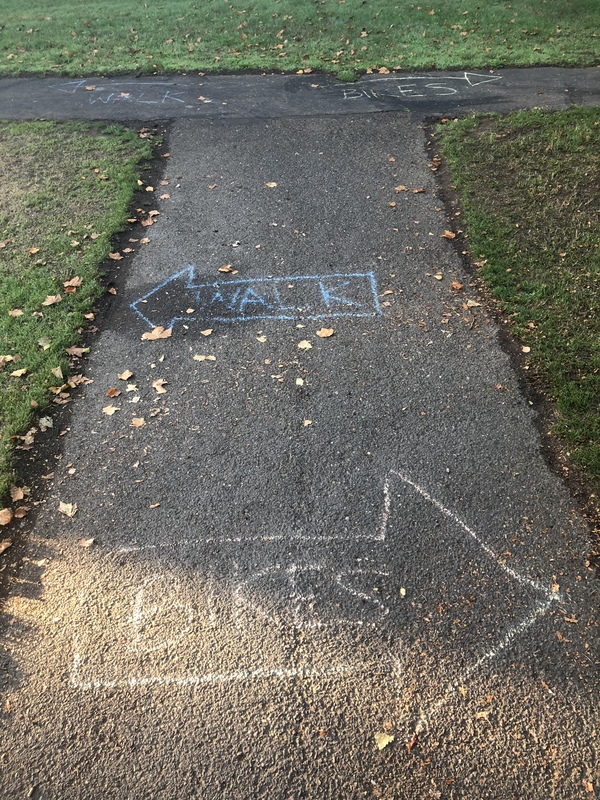 I love using sidewalk chalk to advertise my events by the bike rack and various entrances to school. This year a group of “student leaders” took care of it for me during the school day on Monday. Our weather wasn’t completely cooperative and some of the ads got washed away. 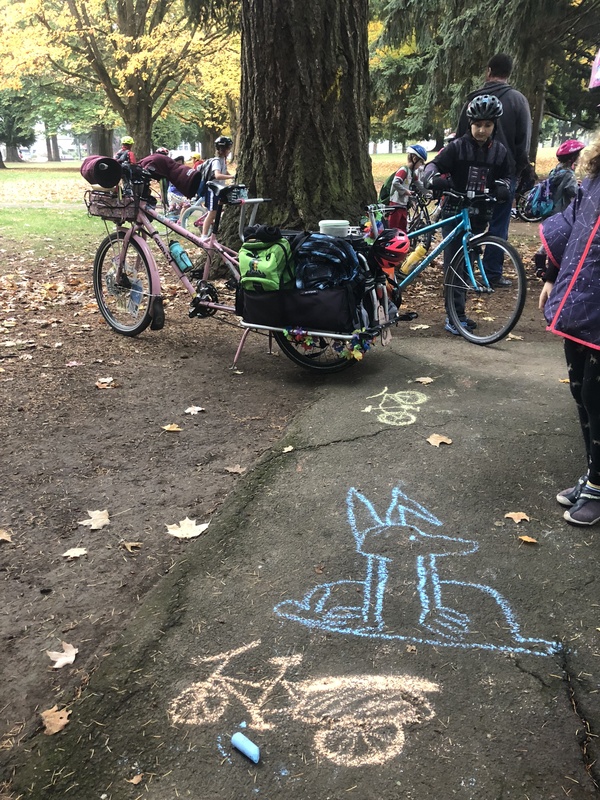 The sidewalk chalk was also great for marking our two routes. I wasn’t sure how I’d lead the two different groups until the morning of the event. One of the student leaders came to help distribute prizes and I tapped her to lead the walkers after doing a quick test run along the well-marked path during the party. I can’t speak for all middle schools, but ours didn’t seem to do any official event. There are some bikers, some walkers, and some school bus riders, but most kids seem to arrive by car. 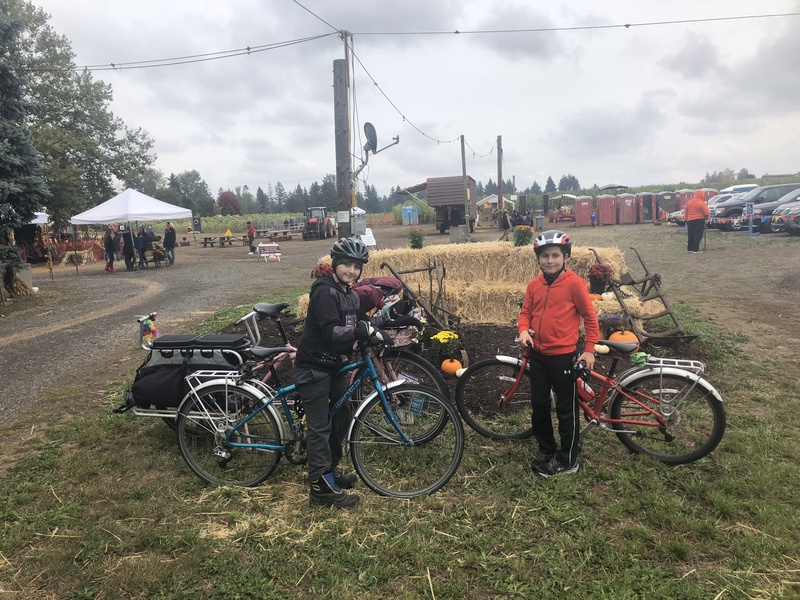 Our middle school starts an hour after our elementary school so I brought my older kid along for the party and then he and I biked four miles to middle school, arriving half an hour early so we had time to stop at a bakery around the corner for a celebratory pastry.